I have been a member of the IEEE Computer Society for 34 years, but problems with renewing online this year make me wonder if it is an organization I want to be associated with. "... delete all the cache and cookies and refresh the browser and then access your IEEE account. Please use latest version of Google Chrome to access your IEEE account and the website works well on Chrome.". That worked, but shouldn't the website work with other browsers? "White check mark on TEAL background"
From the context, I eventually worked out this must indicate "Yes", but that is what the ALT text should say. As it is the website doesn't conform to accessibility guidelines. "⚠ Unsuccessful submission. Please enter the correct CAPTCHA value." But there is no CAPTCHA image displayed on the page and no alternative provided. 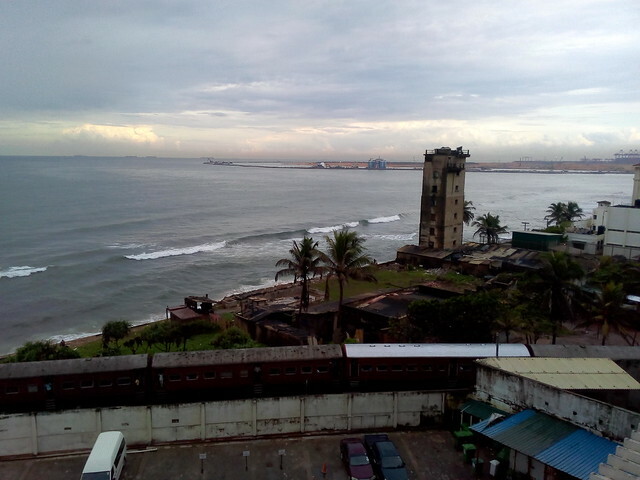 A few weeks ago I traveled from Colombo to Galle along the Coastal Line of Sri Lanka. The line follows the coast for about 100 km, sometimes so close to the beach that you can feel the spray on your face. To plan the trip I used Seat 61 and booked through Visit Sri Lanka Tours. The tickets were at the Colombo Fort ticket office, as promised. However, the office took some finding, as it is not in the main hall of the station (where the local ticket booths are), but through a door to the left (when facing the building) on the outside. There was no one at the Colombo-Galle-Matara window, so after a few minutes I tried the one next to that and got my ticket (it might have been better to pay extra and have the ticket delivered to my hotel). The next challenge was to find the right platform and car, in the early morning commuter rush. After asking a few people I ended up in the right place. I had booked the 1st class observation car, which was "air-conditioned". The car was far from new and the air conditioning was an electric fan on the roof. But it was only one quarter full, and had a clean toilet, which is luxury on any form of Sri Lanaka transport. There was a large window on the end of the car (with one pane cracked), providing an excellent view of where we had been, plus opening widows on each side. One problem is the large number of people bothering you. I had someone at my seat asking for a donation to an orphanage (chased off by the conductor). Someone in a blue shirt then asked if I would like to see in the locomotive. I thought this was yet another tout, but it turned out to be the driver. 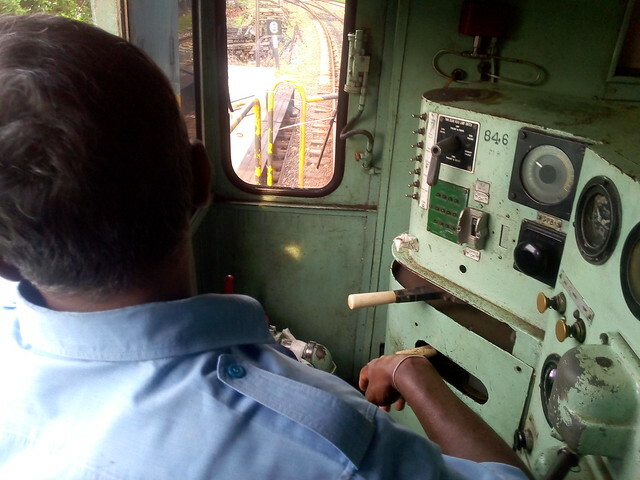 So I got to see the driving cab of the locomotive. I was worried this might distract the driver from preparations, but there was a second crew member in the cab. 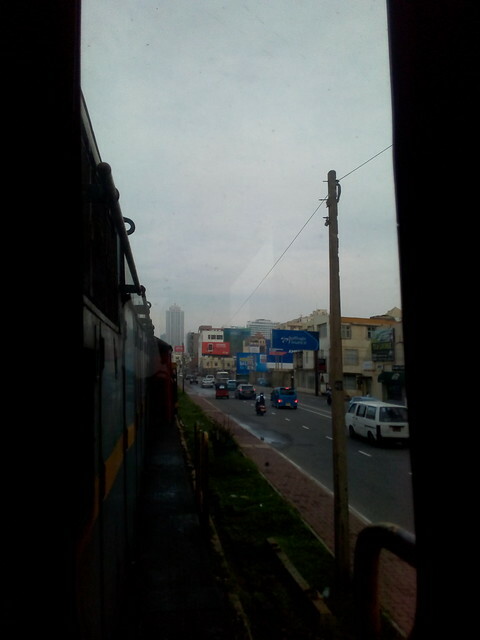 The track goes though the city in a cutting, then out to the beach, just past Galle Face Green. On one side is the coastal road and on the other the beach. There were people causally strolling across the track, as well as Tuk tuks. However, it is clear they know ever inch of the track, every bump (there are many) and where to expect problems. While the coast with villages and fishing boats is impressive, I was more interested in the rapid development evident on the landward side. The passengers are mostly foreign tourists. There are the a few seasoned backpackers. One provided a running commentary which was a little disconcerting at times, pointing out this is the line with the worst rail disaster in world history, when the 2004 tsunami derailed a train. 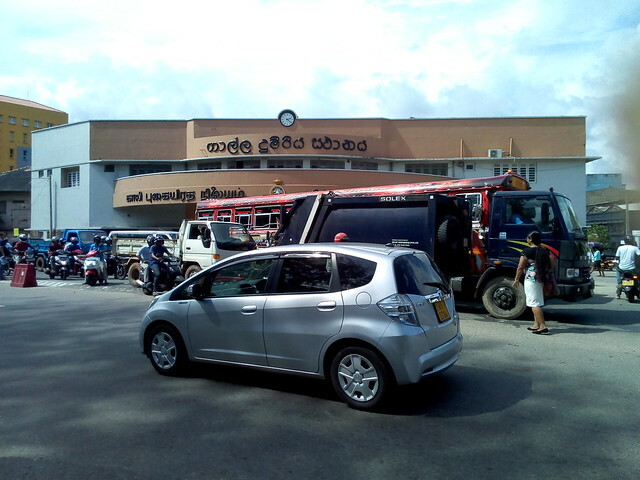 After a comfortable journey, the train arrived on time at Galle Station, an impressive slightly Art Deco looking building. 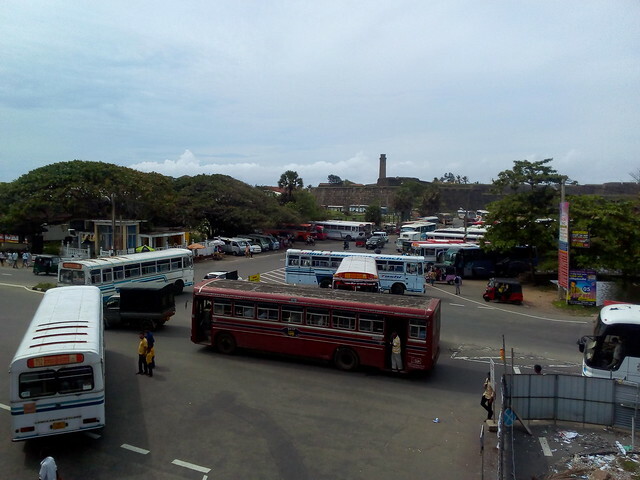 Getting from the station across the busy road to Galle Fort proved difficult. I tried the foot-bridge over a creek to the bus terminus, but then could not find how to get across the road. 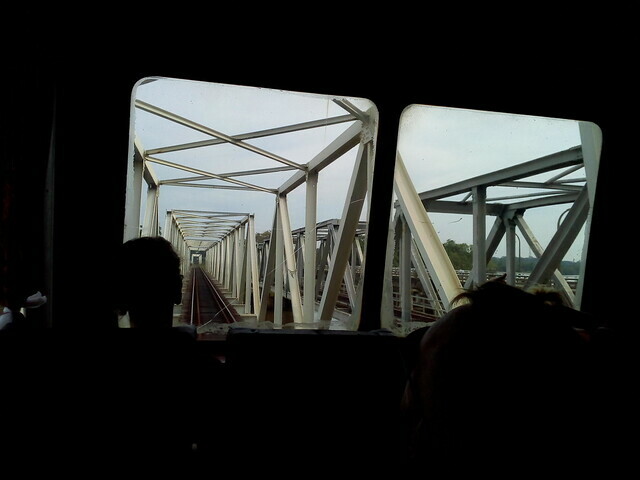 Back across the footbridge and on the other side of the station I found a crossing. This lead to Darmapala Park, which has a bridge to the Fort, but I decided to take a shortcut along the road (dodging past the many parked buses). 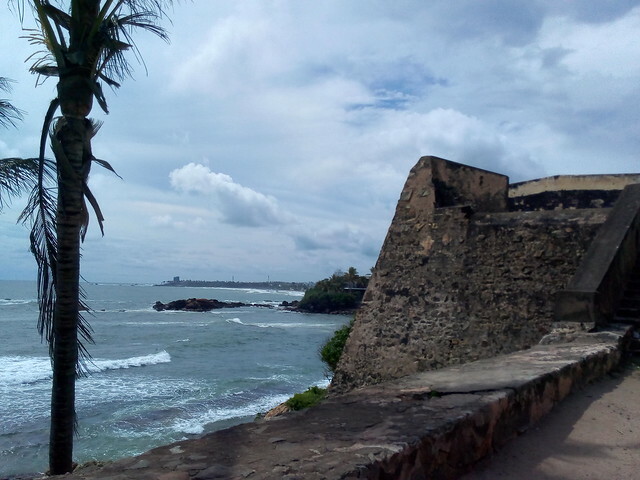 Galle Fort is an impressive structure and large enough to spend a day wandering around. 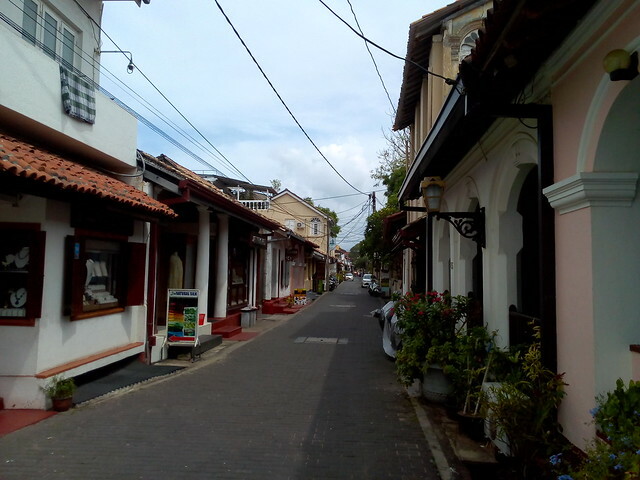 The Galle National Maritime Museum (also devastated by the 2004 Tsunami), provided a break from the heat. The building is almost as interesting as the exhibits, being part of the fort wall. I walked around getting blisters, while turning down numerous offers of Tuk Tuk rides. After wandering around I had a quick drink in the hip little Old Railway Cafe, overlooking the station. It was then a short walk back to the station, where I bumped into the driver, who pointed out that his locomotive was changing ends and the observation car would be at the front. The observation car's end window was now partly blocked by the locomotive. But there was still a good view to ether side. As we rattled along, there were twilight views of people fishing, boats on the beach, and fish for sale at town markets (so close I could smell them). Sitting next to me was a local, who introduced themselves as a guard on the Viceroy Special steam train tours, asking if I knew Scott McGregor. Despite the twilight, and my entertaining companion, th the trip back was an uncomfortable two hours. 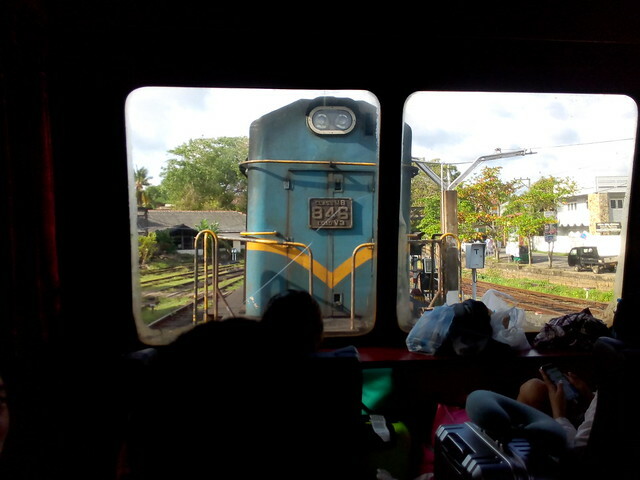 The locomotive was belching diesel smoke. 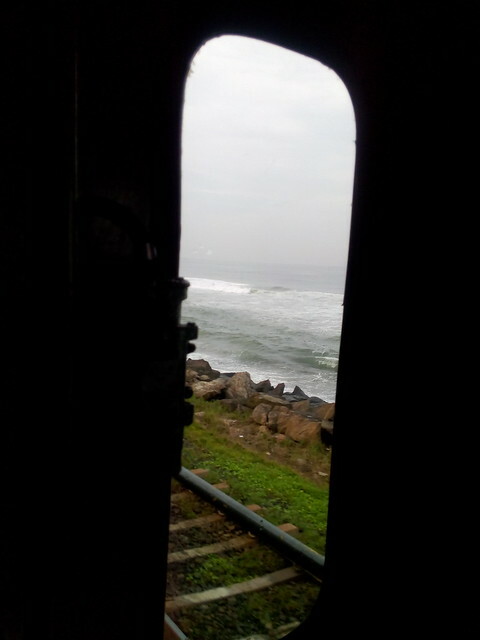 It might be a good idea making the trip one way, from Colombo to Galle by train, and come back another way. Recently I was in Singapore and decided to buy a watch. My decades old hand-me-down watch was making odd beeping noises, stopping occasionally and the batteries were getting hard to find. Also I wanted something smaller, and simpler. The watch I inherited has analog hands as well as a digital display, alarm, and calendar. Unfortunately the current fashion is for either simple analog dress watches, or complex, large chunky diver's style watches. The former lack the alarm function and the latter are large with lots of dials and numbers. I am not a diver or pilot and just wanted something small and simple: hands and one digital display. 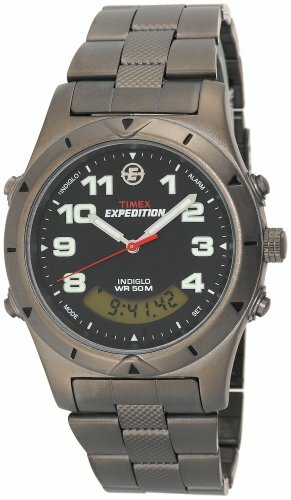 At the less extreme end of the diver's style watch is the Timex T41101 Expedition. This has a very readable analog clock-face and one small digital display. But it still has a bezel with markings around the outside, which has no practical function. This unit goes some way to integrating the digital display on the round clock-face, by making it curved. There appear to be few simpler watches with a round format, perhaps because of the difficulty of integrating a a digital display. More common a rectangular watches. This gives them a slight antique look. 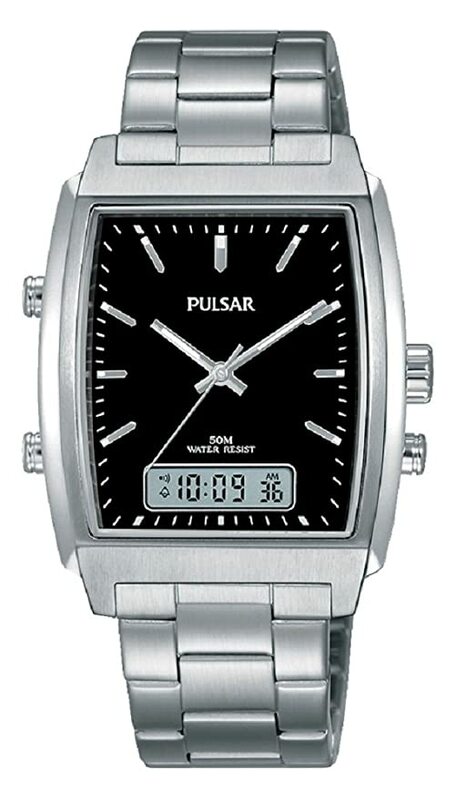 A good example is the Pulsar PBK03. 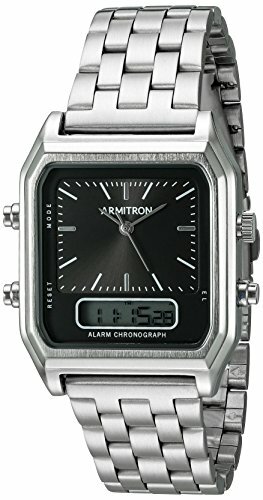 There is the similar, less expensive Armitron 20/5124BKSV, but this does not look quite as elegant and I am not familiar with the brand. Both the Pulsar and Armitron have a crown for adjusting the watch hands. This makes them very quick to set, and is useful if you change time zones often. If you are willing to forego the crown and the sweep second hand, there are less expensive watches. The analog hands in these are set using a push button, which is much slower to use. An examples is the Casio AQ-230A. This watch is unusual, in that the case is plastic, but plated to look like stainless steel or gold in some models, with the back of the case and the band really are stainless steel. 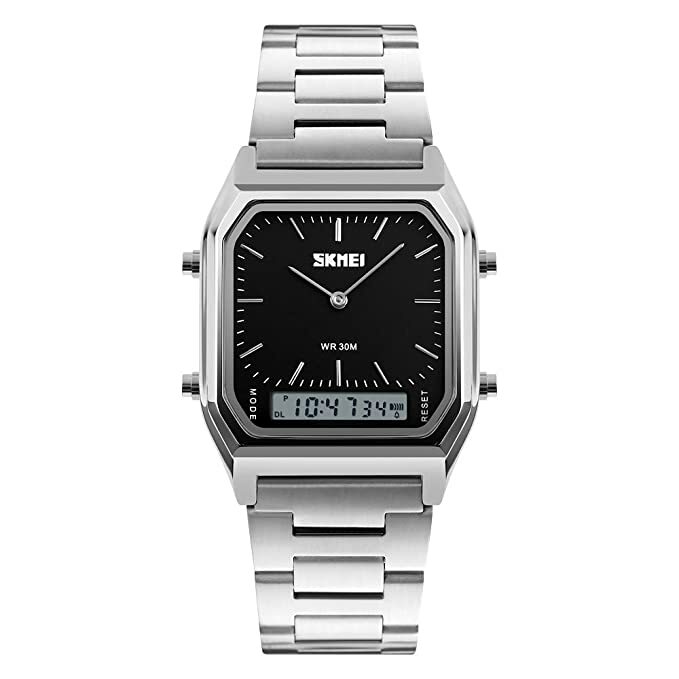 The Skmei by Autulet looks similar, but with a steel case. These watches are much cheaper than the Pulsar and Armitron and don't have luminous hands (the CASIO doesn't have a light for the digital display either). 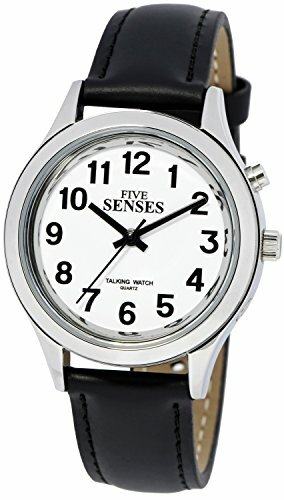 Another option I looked at were talking watches. These are intended for those with limited eyesight and use synthetic speech in place of the digital display. Unfortunately many of the more advanced models are designed to automatically set the time by a radio signal not available in Australia. The simpler Timechant 1267, doesn't need a radio signal. However, a watch is difficult to choose, unless you have placed it on your wrist. So in Singapore I looked at the watches available. The first store I looked at in Orchard Road had prices displayed about four times those I had seen online, and after some haggling this came down to twice as much. I then found the 3D Watch Shop Singapore. They had a large range of stock and prices displayed about the same as online and I purchased the Casio AQ-230A. In early October I was in Sri Lanka to speak at the Computer Society of Sri Lanka (CSSL) National IT Conference (NITC 2018). 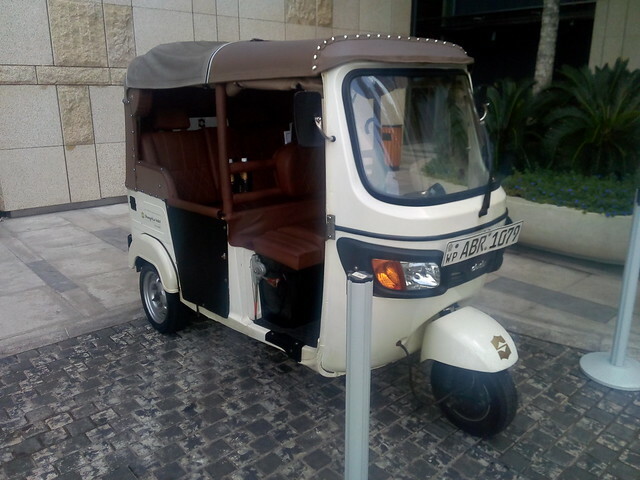 The event was at the Shangri-La Hotel in Colombo, who provided guests with a ride in a battery-electric Tuk Tuk. This provides the excitement of a ride in one of these three wheel taxis, with more comfort and safety. 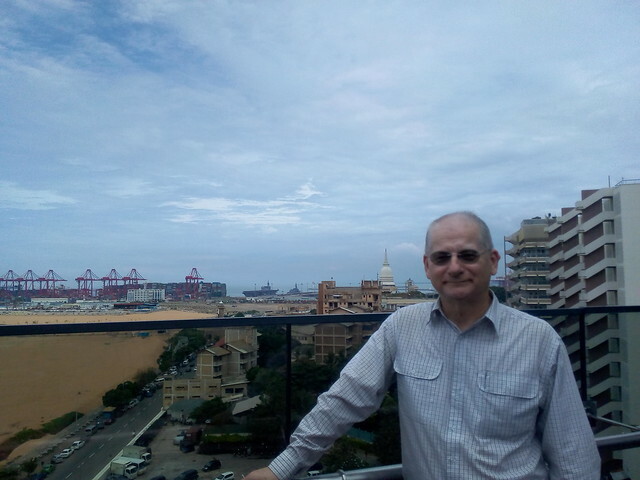 In early October I was in Colombo, Sri Lanka to speak at the Computer Society of Sri Lanka (CSSL) National IT Conference (NITC 2018).What was the waterfront when I visited in 2013 is now a kilometer inland, with reclamation for a new Port City Colombo. The new city is intended to be in the style of Singapore. It will be interesting to see how this goes. The grey warship at the port in the photo background is the Japanese warship, JS Kaga. Like Australia's HMAS Canberra, this was intended to carry helicopters, but may be adapted to operate F-35B stealth fighters.